*New Feature - Single Click AD Assessment Available Now ! Ossisto 365 Health Profiler Execution Subsystem can perform complete health check of targets managed and uncover hidden issues. Execution SubSystemWhat is Dynamic Pack? 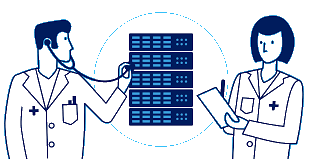 We provide robust Execution SubSystem through which PowerShell-based Dynamic Packs can be executed to perform health check of multiple assessment targets. As for example, we deliver 74 Active Directory Dynamic Packs through which a complete health assessment of multiple Active Directory Forests can be performed. 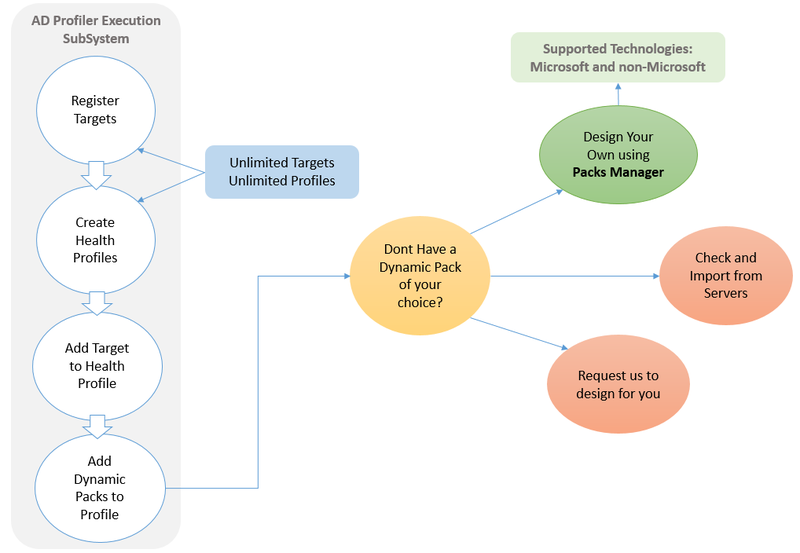 We are in the process of designing new Dynamic Packs for Active Directory, Hyper-V, Microsoft Exchange, Azure, Office 365, VMWare, SQL Servers, Windows Servers and Windows Clients. Design your own Dynamic Pack or import Dynamic Packs for different targets once they are available from Dynamic Packs Server. Use AD Health Profiler As A Service to offer great value to your customers. Buy AD Health Profiler Execution SubSystem to Import Health Profile, analyze data, add your comments and prepare reports. Perform complete health check of multiple production targets from a single computer! Suited for anyone who is an IT Architect/Admin working their way to assess an environment before implementing new solutions. The AD Health Profiler is now being widely used by 300 customers who claim that it has been one of their best investments yet. 97% of our customers are beyond satisfied using the AD Health Profiler and recognize our efforts on its design to be commendable. About 200 Dynamic packs were requested by our clients and its exceptional performance has only kept this number rising. AD Health Profiler leverages Single-Click Assessment feature through which Execution SubSystem can perform all steps from executing Health Profile to generating reports. AD Health Profiler not just performs Health Check, but also reports issue severity and recommendations to fix the issues. The Issue Severity and Recommendations are defined in the Dynamic Packs which can be modified using Packs Manager. Reporting Module can help customize the report based on a Word Template. It supports modifying Severity of the issue and add your own comments against each issue. Reporting Module also supports excluding Health Checks from the report. AD Health Profiler supports unlimited assessment targets through Health Profile concept. Unlimited Health Profiles can be created to contain more targets. Robust Execution SubSystem to perform health check of targets by leveraging Health Check Dynamic Packs. Robust Execution SubSystem to maintain targets health by leveraging Configuration Check Dynamic Packs. Troubleshoot AD Replication issues in a Tree view fashion and schedule checks. Maintain unlimited AD Forests. Control your Azure billing by creating ON/OFF virtual machine policies. Maintain unlimited Azure Subscriptions. Our Products and Execution SubSystems are certified. 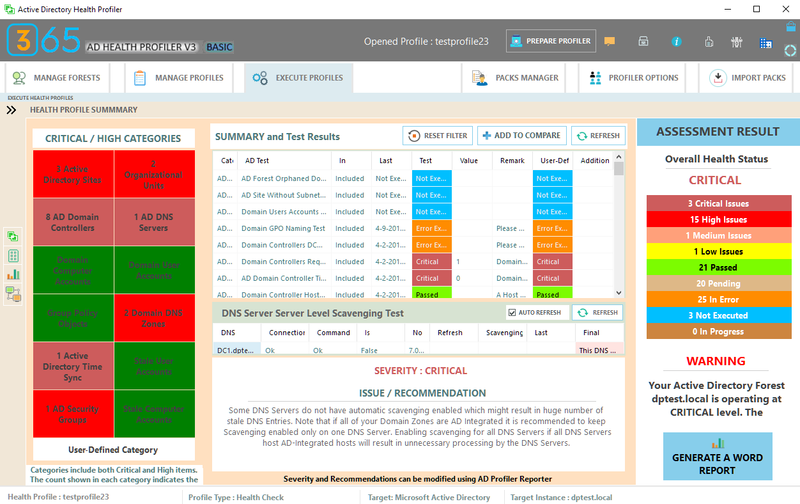 Get your Active Directory Forests assessed using AD Health Profiler. Ossisto has received the globally acclaimed and accepted certification ISO/IEC 27001:2013. Ossisto 365 is an Ossisto venture that aims at providing a complete package of advanced system health check tools and solutions for stakeholders across the IT industry. Embrace great possibilities of improved system health! *We are in the process of updating and releasing the product you have requested. We will notify you once done.